The Niavaran Complex, is a historical complex in Shemiran (northern Tehran), Iran. 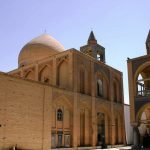 It includes of several buildings and monuments dating back to the Qajar and Pahlavi eras. The complex traces and the origin of garden in the region of Niavaran were used as a summer residence by Fath-Ali Shah of the Qajar Dynasty. Naser ed Din Shah of the same dynasty built a pavilion in the garden which was initially referred to as Niavaran, and later renamed Saheb Qaranie. The pavilion of Ahmad Shah Qajar was built in the late Qajar period. A new mansion named Niavaran was built for the imperial family of Mohammad Reza Pahlavi during the reign of the Pahlavi Dynasty. All of the peripheral buildings of the Saheb Qaranie, except of the Ahmad Shahi Pavilion, were demolished, and the new structures were built to the north of the Saheb Qaranie. Then the Ahmad Shahi Pavilion was used as an exhibition center for presents from world leaders to the Iranian monarchs. 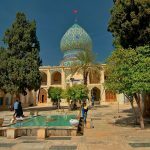 These days, it contains of five museums (Niavaran Palace Museum, Ahmad Shahi Pavilion, Saheb qaraniyeh Palace, Jahan Nama museum and the private library), and other historical, cultural and natural attractions including the Jahan Nama Gallery, Blue Hall, Private Cinema, and Niavaran Garden. The quadrilateral design and its interior archeological designing are inspired by Iranian archeology while making use of modern technology. 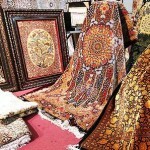 Its decorations have been inspired by the pre and post Islamic art. The building floor is covered by black stone and has an aluminum sliding roof. A French group have been designed the internal decoration and furniture of the palace. There is a great hall in the ground floor of this building in which all the rooms are situated, including a private cinema, dining room, guest room, waiting room and lateral halls as well as the Blue Hall. The office, conference room, Farah Diba’s secretary’s room, Leila’s bedroom and her retainer’s room are located in the half floor of this building. In the stairways there is a room where Mohammad-Reza’s military uniforms and official suits and his medals are kept.